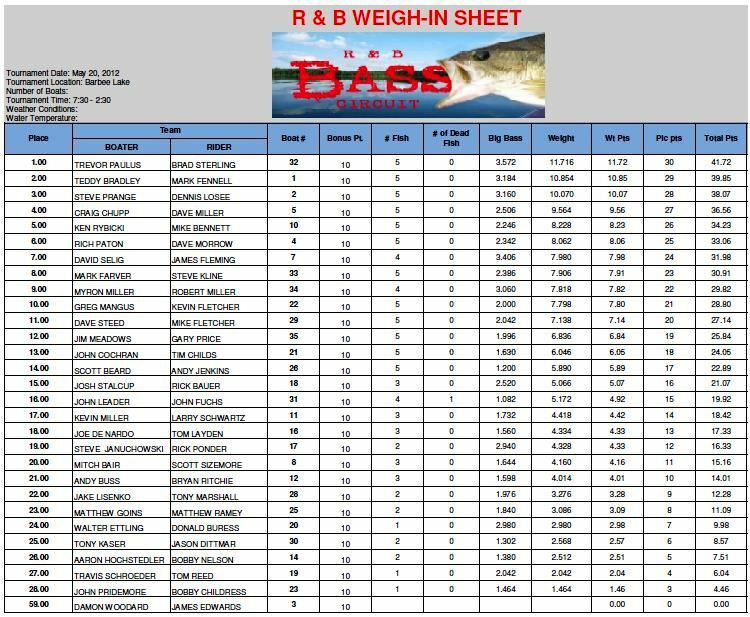 The second tournament of the season has proven important in the R & B’s short history. In the previous two seasons, the team leaving that tournament with the lead went on to become Points Champions. In fact, the teams in that position never relinquished it either. Enter Craig Chupp and Dave Miller. No strangers to success, but how will they handle the big bullseye on their boat? To add pressure, and plain enjoyment for the spectators, the Points Champions this year will be awarded $400. That is more than most tournament winners in our area. Chupp and Miller: you are 1/3 of the way there, but don’t get in cruise control just yet. Their lead is just less than four points on Barbee Lake’s winners, Paulus and Sterling. But that is just the tip of the iceberg: spots 2-5 are separated by just a single point! The top 5 is loaded with heavy hitters and all are R & B veterans. But it would be foolish to look past newcomers Myron & Kevin Miller who sit less than 10 points out of the lead. It would also be foolish to doubt another team coming from behind to take control. Lots of fishing; lots of diverse fishing remain. The 2012 season is shaping up to be full of drama. The R & B Bass Circuit would like to publicly thank a handful of people for helping the event run smoothly. Travis Schroeder took care of the shuttling before and after, which is the worst job on the planet. Tom Reed helped sell 50/50 tickets and t-shirts. Mark Fennell helped with registration, but also grilled hot dogs. 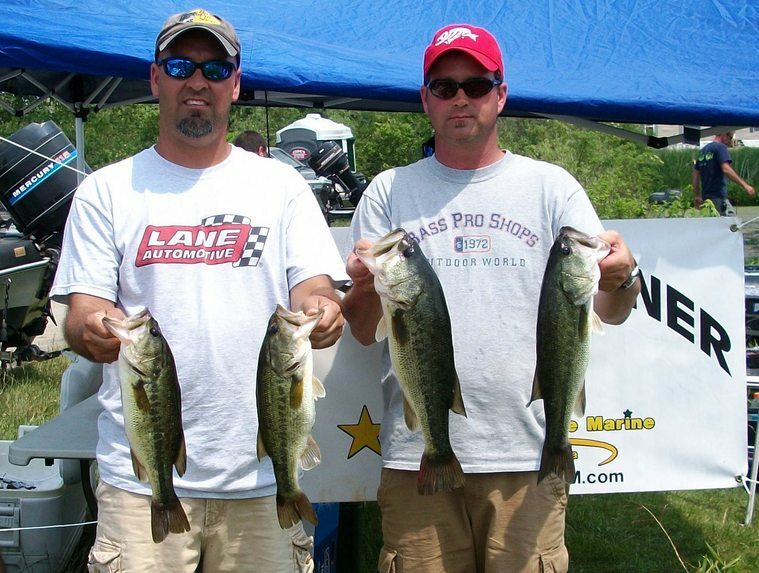 Steve Prange and Dennis Losee did their typical efficient job checking livewells. Steve Januchowski took photos in a crowded environment. Thank you all very much; your help is appreciated by all who participate. in an 11.72 pound limit, which included fish caught on Ernie B's Tubes, and the Starboard Choice Marine Big Bass – a 3.57 pound largemouth. sit just a few points out of first. Despite the end result, the team was not confident at take off. Paulus admits, “Coming in, we were confused. A week ago, the fish were spawning pretty heavily, but we had not been there since and knew we would find the conditions different.” Indeed. The spawn was nearly done Sunday, so the team decided to focus on the areas that held the biggest spawners a week prior. Here they discovered more beds - bluegill beds. This set up well. Their success was a combination of three components: bluegill beds, inside weed edges, and jigs. All of their fish were caught in two foot of water or less. 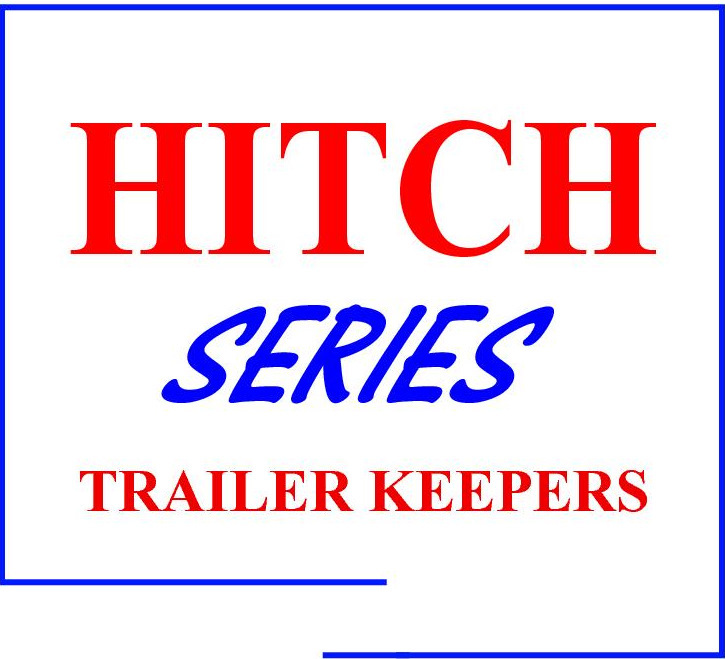 To understate the difficulty, they trolled through the shallowest weeds keying on areas with bedding bluegills and tossing their jigs into any bare area they could find. Through the day, the boat got stuck, the trolling motor got choked with weeds, along with the normal barrage of challenges thick weeds pose. But it paid well. They began on Kuhn Lake where they landed three fish in the first 30 minutes including the big one. The fish fell for Paulus’ homemade green pumpkin/purple jig, which are made specifically to mimic bluegill. From Kuhn, they went to Big Barbee and finished their limit before 10 am. Big Barbee produced 9 more keepers. Jigs were pivotal. They tossed senkos as well, and even though they produced fish, they only produced one keeper; which was a bedding fish. Paulus admits, “We did not get a lot of fish on the jig, but the fish that bit it were all good ones.” They believe the fish they caught were preying on bluegill. 2nd Place: They're Baaaaack! After the opener on Six Span, many saw the door open to claim top honors as the defending champions failed to claim a top spot. Apparently, though, they do not get the memo, and it is safe to say 2011 ChampionsTeddy Bradley and Mark Fennell have no intentions of relinquishing their crown. This high finish places them back in the top 4.
and the thicker the weeds, the better. They pegged 3/4 ounce tungsten weights to the plastics and covered areas thoroughly. The day began well for the champions as they had a limit in just 90 minutes. 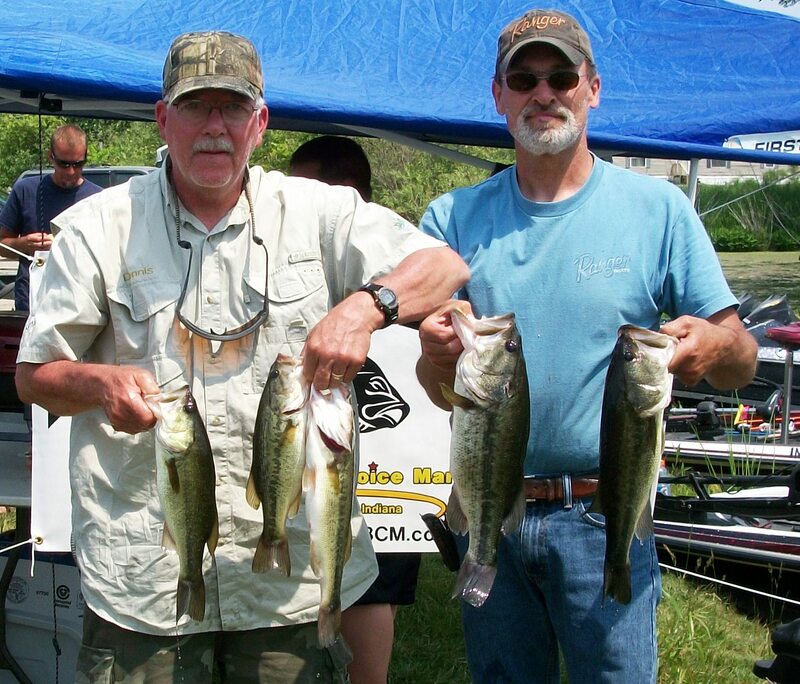 They caught 9 keepers in all and spent their entire day on Big Barbee Lake. 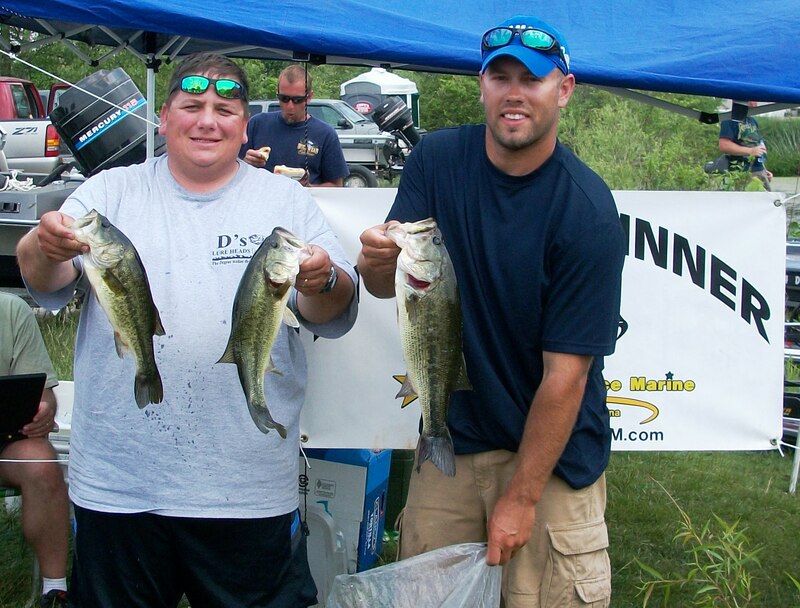 Their biggest five fish weighed 10.85 pounds which won them $446. 3rd Place: During the inaugural season, 2010, Steve Prange and Dennis Losee made a hard charge to become Points Champions before eventually succumbing. Last season was an uncharacteristic tough season for the veterans. Well, it appears they are determined to make another run in 2012. Beyond this tournament, they have been cashing in all over Michiana this spring. It looks like they've rediscovered their mojo. tubes, twin-tailed grubs, wacky worms, before establishing a pattern with flukes through shallow weeds. Prange explains, "We saw fish chasing all morning and could not get them to bite until we threw flukes at them. We caught most of our fish with the fluke." This pattern held up through the morning, but the bite got tough again after noon. However, their biggest fish, a 3.16 pound largemouth, fell for a wacky worm. They landed 9 keepers total. 4th Place: The only team to earn two top 5 finishes this season are Craig Chupp and Dave Miller. Consequently, they have claimed the top spot on the mountain. Miller could not believe it, "I did not think we would be close [to top 5]." Their 9.56 pound limit won them $178. managed to put three in the boat before moving onto Irish Lake where they finished their limit. 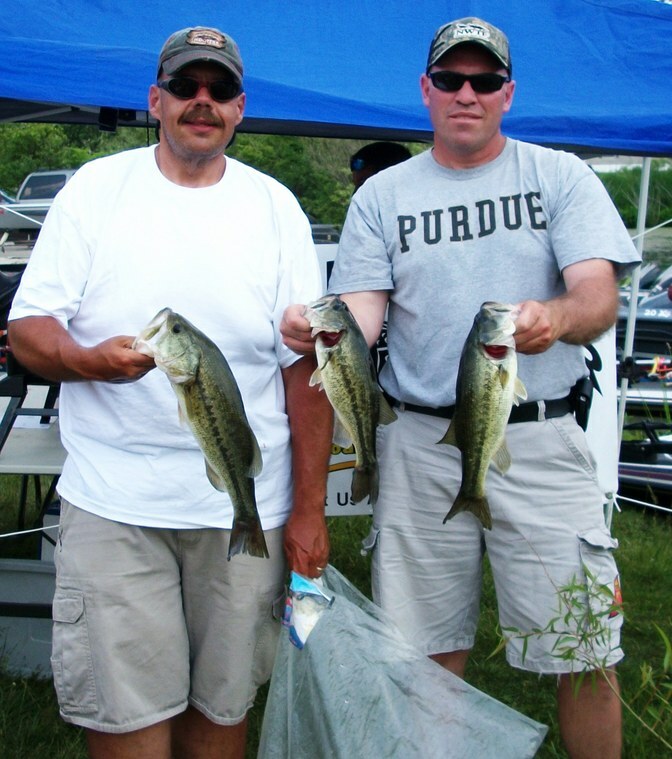 They ended on Kuhn Lake and culled out two 14 inch fish with 15 inch fish. They were the only top 5 team not to spend time on Big Barbee Lake. Quite naturally they began on Kuhn Lake and nearly every inch of breakline was inundated with their worms. 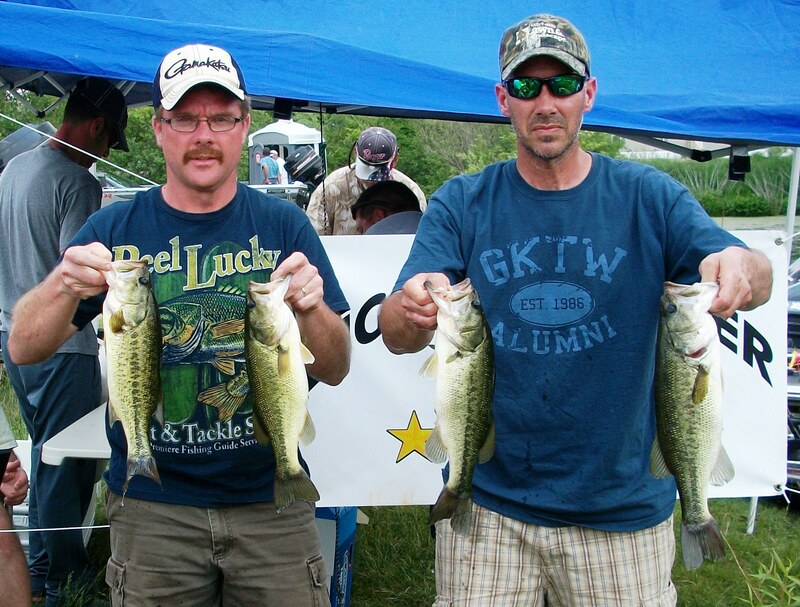 They bagged three keepers before reaching Big Barbee Lake. They ventured onto this lake and added three more keepers before being forced to head back. Back on Kuhn they were able to eliminate their 14 inch fish on their way back to the ramp and weigh a solid limit of 8.23 pounds. They won $106. 6th Place: Rich Paton and Dave Morrow moved into 3rd place with another solid finish. Their 8.06 pound limit earned them $70. 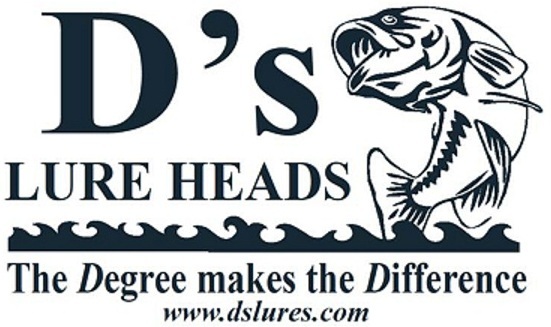 D's Award:James Fleming and David Selig won the D's Award with 7.98 pounds and the second biggest fish of the day: a 3.41 pound largemouth. That fish also earned them the Solar Bats Big Bass Award. Not only did this award them $68 but also qualified them for a new pair of Solar Bat Sunglasses! To insure you are qualified for this award, visit the Bonus Money & Prizes pages. Click on Results for Adobe file. 5th Place:Ken Rybicki and Mike Bennett found their stride Sunday in an unconventional, and unappreciative, way. Their motor would not start and they were forced to rely solely on their trolling motor. While this is frustrating for any team, those who know the team figured it may play into their advantage. Rybicki is one of the best wacky worm fisherman in all of Michiana and this mishap limited what they would do. It did make soaking an area up for all its worth more ideal, and the wacky worm proved effective for them again. 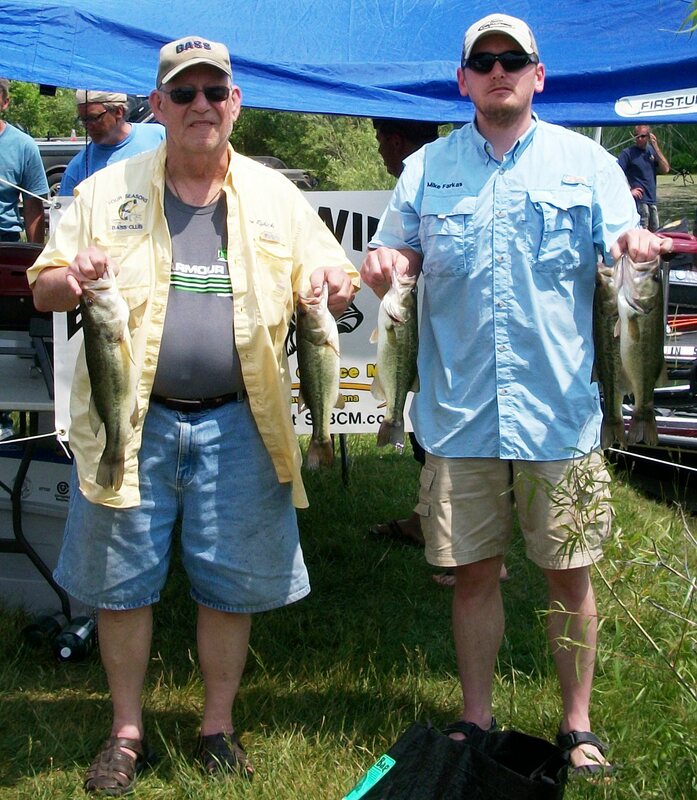 Bennett recognizes his father-in-law's talent, "Ken will always catch them on a wacky worm when he is able to slow down and break an area down.